The Philadelphia is a no-nonsense, basic motel but perfectly fine for the price. There's no breakfast included. The rooms are clean, could do with a little bit of a spruce up, but are comfortable. We were disappointed after a long day of driving that Ogilvies restaurant on site was closed for dinner on a Saturday night. We ended up calling the courtesy bus and going to Moama RSL for dinner. Ange and Laurie were friendly and efficient and the check-in process was quick and easy. We would stay here again. We booked a 'Queen Room' at the Philadelphia Motor Inn partly because we remember fondly the television series "All the Rivers Run" from many years ago. When we arrived, our room more than lived up to our expectations. We particularly liked the spacious layout, the clean, neat and tidy appearance, the comfortable bed, good shower, generous parking space and, mostly, the friendly and helpful hosts. We enjoyed our stay and would stay again if in Echuca. This weekend we were the recipients of genuine above and beyond Aussie rural hospitality. We stayed at the Philadelphia Motor Inn, Echuca on Saturday night. When we went to leave on Sunday my car would not start. After a quick call to roadside assistance, the service technician was there in about 10 minutes, only to advise that the car would have to be towed to the depot on Monday morning. Ange and Laurie the owners of the Philadelphia had already advised that we could use the room for as long as required after the usual checkout time. We were both overwhelmed with their amazing kindness and generosity and are both truely grateful for their help over the past two 38 degree C days. Their rooms are spacious, comfortable and very reasonably priced. Thanks Ange and Laurie for ensuring our difficult situation was extremely comfortable. Just stayed in this motel for 2 nights, very clean and comfortable. The restaurant is no longer open but they are still providing cooked or continental breakfast. The current owners are a lovely couple, very friendly and helpful. We booked a Queensize and the Disabled Room, both were very clean and comfortable. Echo all the past positive comments. This place is a rippa'. Spotless, comfortable, friendly, sensational home style meals and most of all, you are made to feel like it is your place. Now a regular stay when in Echuca or nearby. Thanks Guys. Room was quite large and well set out. Bathroom was also bigger than normal. Facilities in both were great. Only a short drive into town. Rates were very reasonable and the owners and staff were lovely. Would definitely return. We were passing through Echuca and chose to stay here because they are pet friendly. We were greeted with friendly smiles and treated well. The rooms are spacious and clean. Everything was provided, we couldn't ask for anything more. Philadelphia Motor Inn Echuca places you within a mile (2 km) of Echuca Back Nine Golf Course and Echuca Harness Racing Club. This 3-star motel welcomes guests with 24 rooms and conveniences like an outdoor pool, free in-room WiFi, and free self parking. In addition to a meal at the onsite restaurant, you can also enjoy a drink at the bar/lounge. Get a pick-me-up at the coffee shop/café. For your convenience, breakfast is available for a fee. Guests can enjoy digital TV and stay connected with free WiFi. The bathroom offers hair dryers and free toiletries. Other standard amenities include a refrigerator, a minibar, and a coffee maker. 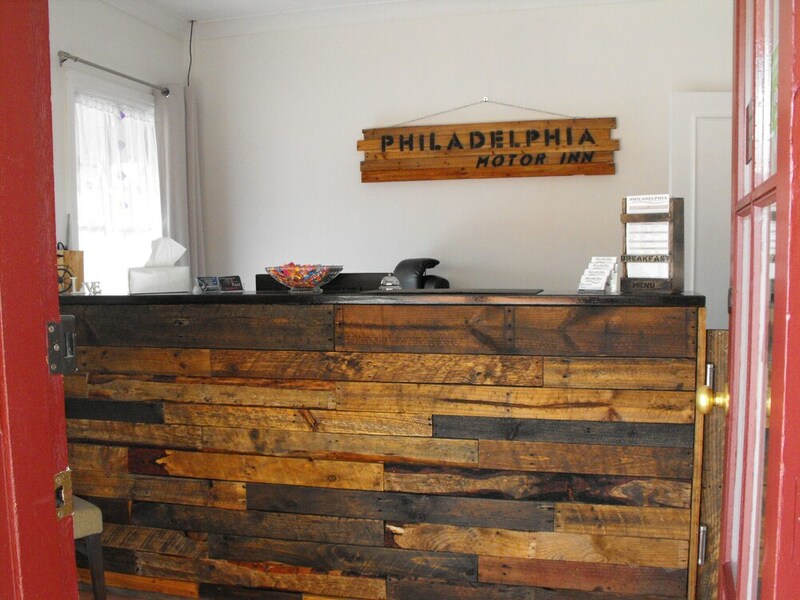 At Philadelphia Motor Inn Echuca, guests have access to an outdoor pool, free WiFi in public areas, and conference space. If you plan to drive, free parking is available. Front-desk staff can assist with tours or tickets, dry cleaning/laundry, and luggage storage. Additional amenities include a business center, a picnic area, and barbecue grills. Recreation features at Philadelphia Motor Inn Echuca include an outdoor pool. The preferred airport is Albury, NSW (ABX): 124.2 mi/199.9 km. Distances from the property's location to the airport are straight-line distances and may not reflect the actual travel distance. The front desk is available during limited hours. Driving? This property offers free self parking, along with RV, bus, and truck parking. This property's front desk is open daily from 7:30 AM - 8:30 PM. The motel can refuse certain bookings for the purpose of group events or parties, which include pre-wedding stag/bachelor and hen/bachelorette parties.